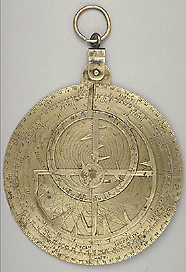 This unusual instrument does not have a mater, but consists of a plate with a zodiacal calendar scale as well as markings for a plate for the sixth climate on one side, and a degree scale, a double horary quadrant and a shadow square on the other side. A simple throne is an integral part of the 'plate'. The instrument was in the 'war time exhibition' at the British Museum in the gallery destroyed by incendiary bombs in 1941 and the rete is consequently badly damaged.